My big running comeback hit a bit of a roadblock following the Bele Chere 5K in late July. Immediately following the race I was mentally ready to push myself farther and faster. I had my eyes on the Apple Festival 8K this past weekend as my next race. I set out the first week of August to push my 3 mile time well below 30 minutes AND to start adding miles so I could race the 5 mile distance. You may be able to guess where this story is going. It turns out I pushed a little too hard, too fast. My hips started bothering me the week after the Bele Chere 5K. Even though the “pain” was minimal, I knew I had triggered a problem. The trouble spot reminded me of the injury I had with my hips at the end of marathon training last year. I believe the combination of adding too much speed to quickly AND running hills I had not trained on during the 5K caused the problem. Luckily I caught it early and was able to make a quick plan to relieve the hip problems. 2- Do lots of running related yoga. 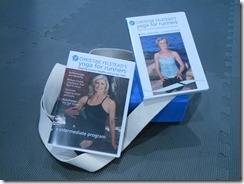 Including my Christine Felstead Yoga for Runner’s DVD’s. 3- Do strength work that focuses on hips… Hello lunges! 4- When running again- don’t push my time for several weeks. I made one more important decision for my running health; no Apple Fest 8K this year. Even though I really wanted to do the race, I decided it was NOT in my best interest to amp up my miles and speed so quickly. I would rather be running healthy and SLOWER than not running at all. I really envy people who seem to be able to run so fast without triggering injuries. I am not one of those people. I have to find a balance between striving to do better and staying injury free. My hips don’t lie about a potential injury! My “healthy hips” plan worked. I am now a few weeks back into full time running without triggering more hip problems. YAY! These are my watch times from my last three weekend runs. I haven’t been pushing too hard but I am seeing some natural progression. My treadmill 3 mile time is back to 30:16 as of yesterday and my goal is 29:59 in a week or two. I lost a little momentum with my comeback, but I’ve had two good training weeks with no injuries or lingering hip pain. I feel back on track to start running faster again. Hopefully my hips have gotten stronger and with a little TLC they will not give me any trouble this time around! DO YOU HAVE ANY INJURY PRONE AREAS YOU HAVE TO WATCH OUT FOR WHEN YOU RUN? HAVE YOU EVER MADE A COMPLETE RUNNING COMEBACK? HOW LONG DID IT TAKE YOU TO WORK BACK TO YOUR PREVIOUS TIMES? HAVE YOU EVER DECIDED THAT NOT RUNNING A RACE WAS IN YOUR BEST INTEREST? Take it easy with your return. I learned the hard way that it’s best to take it easy and only come back when you’re ready. I tried to come back too soon for fear of losing some of my fitness and ended up dealing with it way longer than I should have. It’s the same thing I’m sure you’ve heard before, but as runners, I feel that sometimes we’re hard headed beyond belief on matters such as this. hard headed runners? nah– 🙂 We always want to comeback right away. Thanks for the tip- I will keep taking it slow. Great blog! I decided that not running a half marathon this fall was best for me given the time involved and just not being prepared. It happens, and I’d rather be able to run a little than be so injured I can’t run for months. I’m considering the Thomas Wolfe actually! I’ve never run it before… hopefully I will be in shape by then. I’m sure I can finish it, but my pride wants a better time. Hey Julie! Ive enjoyed watching your return to running! Its great to have that much drive building up inside after a long absence! The trick is to keep the breaks on until you have reintroduced your legs/body to the rigors and compaction of running. Ive made several comebacks over the years. I Love the challenge of getting back up to speed and distance! Let me know if you need anything! Keep up the hard work! Thank you so much Tim! It is getting easier. I’m just not patient… but if I look at the progress over the past 2 months… it’s more than it seems. I really appreciate your support.